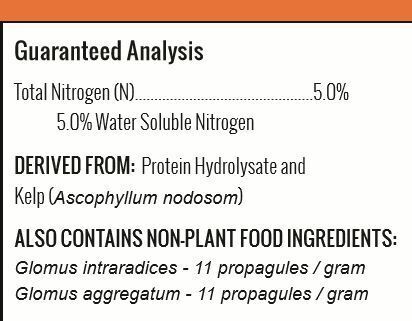 Nitro Nutrients: Atomic Root Powder is a unique root-enhancing formula made to grow and maintain massive healthy root system throughout the growing season. Nitrogen (N) is the most important mineral element in plant nutrition. It consists of amino acids, proteins and nucleic acids, making it fundamental to the growing process. Ascophyllum nodosom is a natural seaweed extract. It provides trace minerals, is a rich source of potassium and a natural plant hormone. Together they accelerate growth, increase flowering and fruiting, intensify color, and provide resistance to disease and insect infestation. Mycorrhizal fungi defines the mutually-beneficial relationship between plant root and fungus. This fungus causes the feeder roots to branch. 1oz makes 60 gallons of solution per weekly feeding.